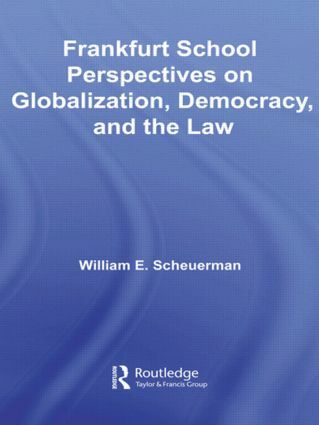 Frankfurt School Perspectives on Globalization, Democracy, and the Law makes use of the work of first-generation Frankfurt School theorist Franz L. Neumann, in conjunction with his famous successor, Jürgen Habermas, to try to understand the momentous political and legal transformations generated by globalization. This volume demonstrates that the Frankfurt School tradition speaks directly to some pressing political and social concerns, including globalization, the reform of the welfare state, and the environmental crisis. Despite widespread claims to the contrary, the legal substructure of economic globalization tends to conflict with traditional models of the "rule of law." Neumann’s prediction that contemporary capitalism would decreasingly depend on generality, clarity, publicity, and stability in the law is supported by a surprising variety of empirical evidence. Habermas’s recent work is then interrogated in order to pursue the question of how we might counteract the deleterious trends accurately predicted by Neumann. How might democracy and the rule of law flourish in the context of globalization? The book is intended for scholars and advanced students in political science, sociology, philosophy and cultural studies. Introduction: Why the Frankfurt School? Franz Neumann: Legal Theorist of Globalization? Cosmopolitan Democracy: Democracy Without Law? Global Governance Without Global Government?